Few weeks ago, I went to Australia and got the chance to experience flying with Scoot. It is a low-cost long-haul airline owned by Singapore Airlines servicing flights to several countries in Asia-Pacific like the Philippines and Australia. It wasn’t my first Scoot flight experience but I was more than excited to fly with the airline again. 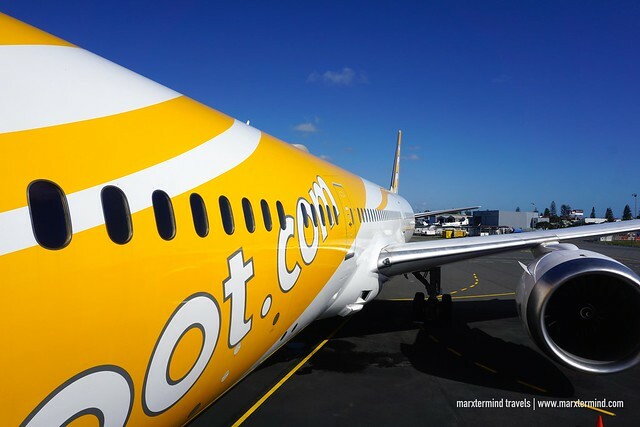 Now that TigerAir Singapore and Scoot merged and operates under one brand. This merger paved the way in opening new routes from the Philippines. 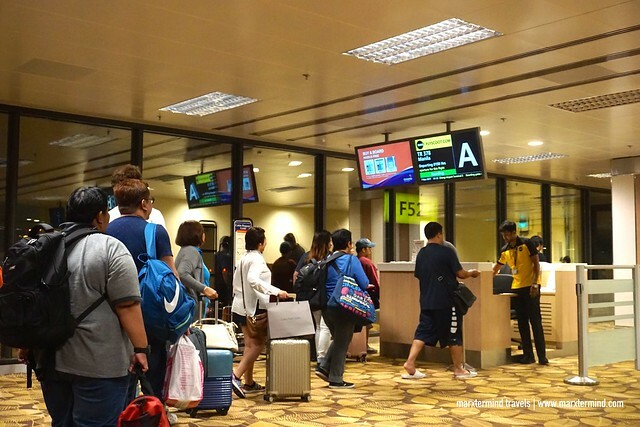 It is great news most especially for fellow Filipino travelers. With Scoot Airlines, booking flights to destinations like Australia, Greece, India, Maldives and other places in Asia-Pacific becomes more affordable and convenient. My trip to Australia was the perfect opportunity to fly with Scoot again. I went to Queensland and some other parts of New South Wales to explore some of its beaches. I also visited some of my relatives in Gympie. Flying to Queensland from Manila, Scoot was the best and cheapest option. 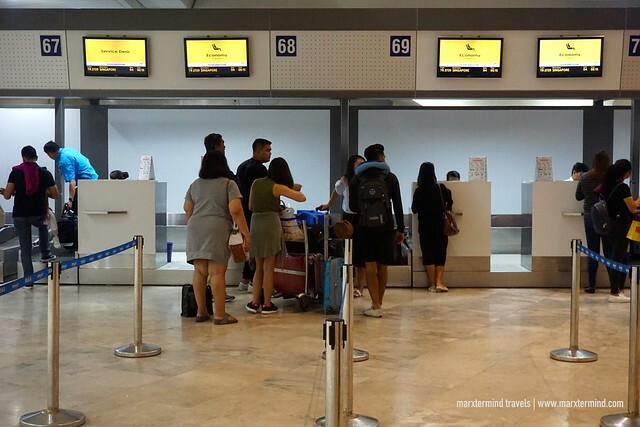 Scoot services flights from Manila to Gold Coast via Singapore. My flight from Manila to Gold Coast via Singapore was early morning at 5:15 AM. I arrived at the airport past 2:00 AM. I paid for my travel tax and approached the Scoot kiosk located before the check-in counters. The ground staff inspected my luggage probably to see if there were some prohibited items. They didn’t find anything so I was good to go. Scoot check-in process was very efficient. I didn’t wait too long for my turn because there was more than enough staff assisting passengers. At the check-in counter, I presented my ticket, my passport and tourist visa then dropped my baggage. The staff asked me if there was still anything I needed inside my luggage because I will already be getting it when I arrived in Gold Coast. I said none, then the staff handed me my boarding pass. The staff also informed me that I needed to go to the transfer lounge after I arrived in Changi Airport to get my other boarding pass for my flight from Singapore to Gold Coast. When everything’s done, I went right away to the immigration. Good thing the queue wasn’t too long. When it was my turn, I gave my departure card and presented my passport, boarding pass and tourist visa. The immigration officer asked me if it was my first time in Singapore. I told him that I would only be there for layover. I will be going to Australia. The officer also asked about my job – and after some few questions, he stamped my passport. Whew! Still had enough time before boarding, I went to one of the airport lounges and had my breakfast. When I went to the boarding gate, there were already a lot of passengers waiting. When boarding for my flight was announced, I was glad to see that it was done orderly based on passengers zone and seat number. Scoot flights from Manila to Singapore utilize Airbus A320. The entire flight is 3 hours and 40 minutes. I was seated in an emergency exit row. It was spacious and has more legroom. But to be honest, when I get assigned in an exit row, it gives me this feeling of having extra responsibility from other passengers. Our flight departed on schedule. When the seat belt sign was already switched off, it prompted the crew to start serving on-board meals. 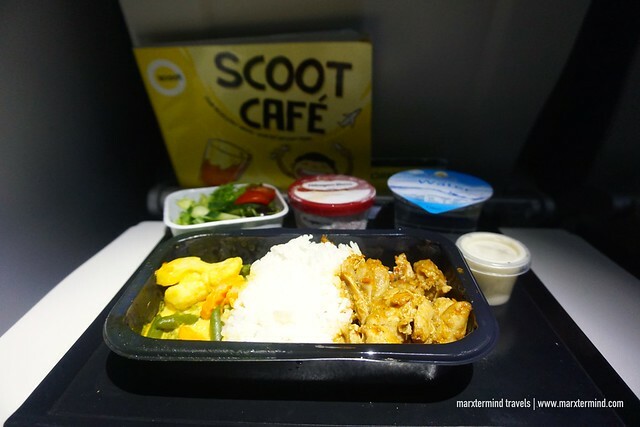 Part to experience Scoot, I had a pre-booked combo hot meals. I had Cardamom Butter Chicken with soda in can and a small bar of Cadbury chocolate. The meal was served hot. The portion was also enough. I liked the chicken, which was tender. When I finished my meal, I took a nap for an hour. When I didn’t able to get back to my sleep, I just listened to some songs in my iPod. After three hours, the captain announced our arrival to Singapore. 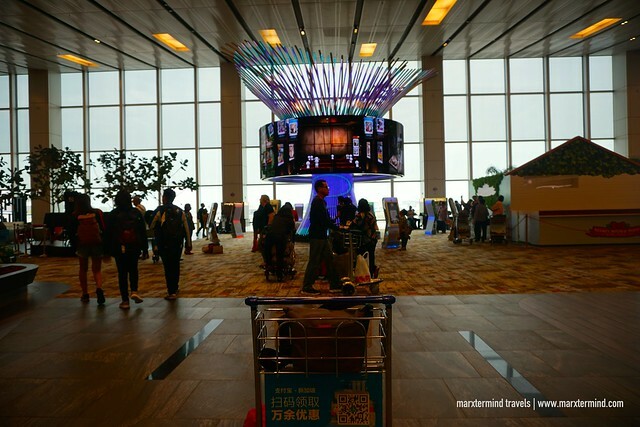 We landed at Singapore Changi Airport around 8:30 AM, which was ahead of our scheduled arrival. 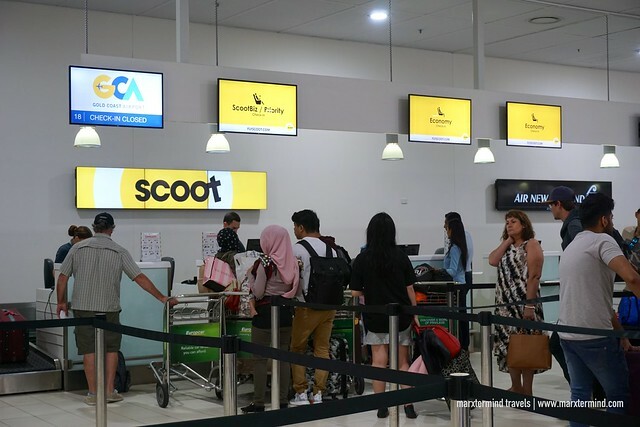 Scoot-Thru is a complimentary service offered for passengers with flights connecting between Scoot and other selected partner airlines at Changi Airport. Because I was on a connecting flight, I didn’t need to go to the immigration then get my luggage and check in again for my next flight. Since I already checked in at the airport in Manila, all I had to do was to go to the transfer lounge in Singapore Changi Airport and get my boarding pass for my connecting flight. Transfer lounge for Scoot is at the Terminal 2 of the airport. Please do note as well that all Scoot flights operate in this terminal. After getting my boarding pass for my flight to Gold Coast, I went out of the airport. I still had 10 hours to spend so I went to downtown Singapore and visited some tourist spots. I went to the boarding gate 30 minutes before my flight. Scheduled departure for my flight was 10:25 PM. Flight time from Singapore to Gold Coast is 7 hours and 50 minutes. Flying on a budget airline with that flight duration might sound torturous but not with Scoot. 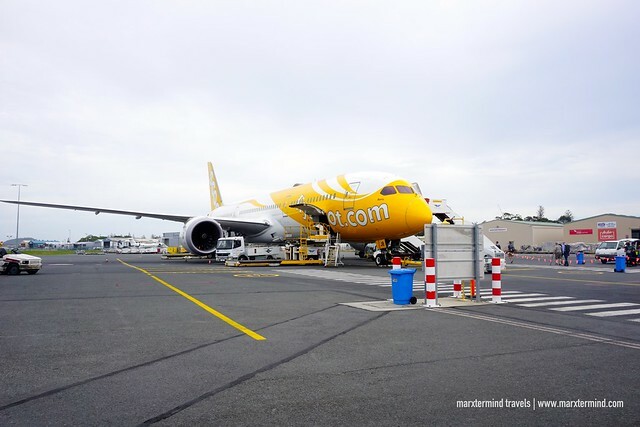 Scoot utilizes Boeing 787 Dreamliner, a wide-body fleet with spacious cabins and roomy seats. My seat was economy class in Scoot in Silence Zone. It’s a section behind Scoot Biz where passengers can enjoy peace and silence. Already feeling sleepy and tired that time, this part of the plane was my much-needed place. Boarding happened smoothly and quickly. I dozed off and didn’t realize that the plane already took off. The flight attendant just woke me up to serve my pre-booked meal. I had a premium selection that includes Stew Chicken with Rice, salad on the side and a cup of ice cream for desserts. No other passengers were on my row during the flight. I was able to lie down and had a good night rest after finishing my meal. It was too comfortable sleeping that it was already morning when I woke up. I didn’t feel that it was a long flight, honestly. After half an hour, the captain announced our arrival in Gold Coast. We landed at the airport around 8:00 AM. We disembarked the plane and went to the airport terminal. I claimed my luggage and passed through security and immigration. 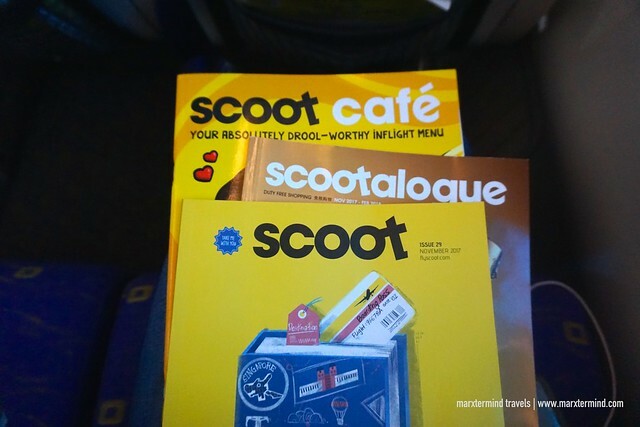 On my flight back to Manila, I flew with Scoot again. My flight was connecting via Singapore. Flight departure was 9:20 AM, which means I had to be at the airport early morning. I stayed in one of the hostels in Coolangatta before my flight, so it would be easy for me to go to the airport. I arrived at the airport around 7:30 AM. I immediately went to the check in counter of Scoot. There was a long queue already but the line was moving. Three counters were available to check in passengers. I only waited for half an hour to have my turn. I presented my passport and dropped my baggage. The ground staff handed me my boarding pass for my flight to Singapore. I asked her if I would already be getting my luggage in Manila but insisted that I needed to get it in Singapore. That was fine with me because I wanted to go out of the airport. I can simply claim my luggage after immigration then check in again for my flight to Manila. I went to the boarding gate afterwards. Security is strict in Gold Coast Airport. I passed through two security scanners then immigration before I was able to get to my boarding gate. Boarding commenced few minutes after. Same with my flight from Singapore, I was put in Scoot in Silence Zone. 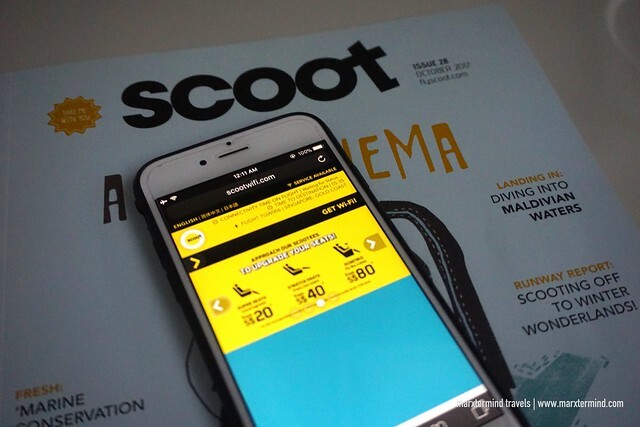 I felt pleased that Scoot has this kind of service for passengers to enjoy added comfort and convenience. No kids under the age of 12 are allowed in this area. This zone is also in front of the plane, which means passengers can be able to get off first upon landing. 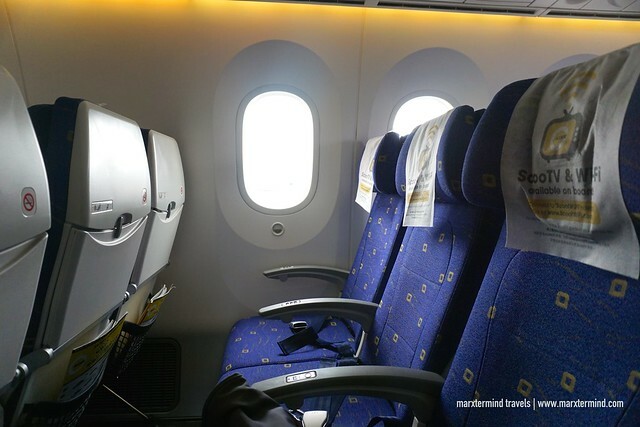 Scoot in Silence Zone also has Super and Stretch seats, where seats have 30-50% more legroom than Standard seats (up to 34” pitch). It also has adjustable headrests. I was seated in a window seat in row 7. Fortunate enough, no other passengers were seated in my row again. To stay connected while on air, an in-flight Wi-Fi is for purchase. There’s also ScooTV, the airline entertainment system with choice of few movies and TV show that comes complimentary for ScootBiz but with charge for economy class passengers. For some good reads, a magazine is also provided at the seat pocket. Our flight departed on time. 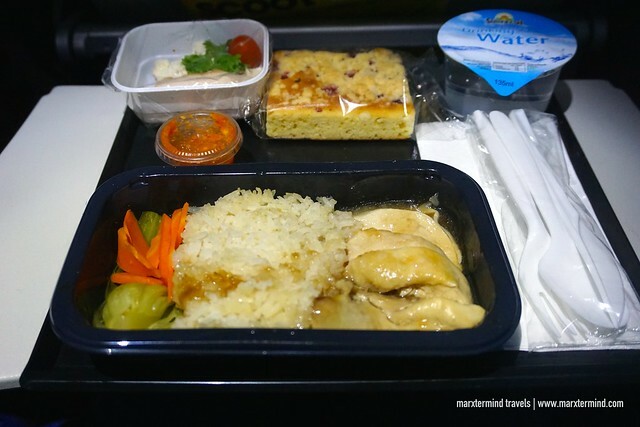 After taking off, crew started to offer meals on-board. Pre-booked meals though were served during lunchtime. But if you want to have it earlier, you may approach one of the flight attendants. Because I wasn’t really that hungry yet, I just waited for lunchtime while I sorted some photos in my laptop. I had Singapore Signature Chicken Rice, a premium selection that also comes with two side dishes and a cup of mineral water. I enjoyed the meal. But I was expecting to have a cup of ice cream again. But I learned later on that it is only available for long-haul flights departing Singapore. Still feeling famished, I ordered extra cup of noodles. The entire flight was comfortable, as usual. We landed Singapore Changi Airport past 3:00 PM. Upon arriving, I went to the transfer lounge for Scoot at Singapore Changi Airport. I asked the transfer desk about my luggage because I didn’t want to go through the immigration anymore then check in for my next flight. The check-in counter in Gold Coast might have overlooked that my flight was connecting. The staff asked for my itinerary, boarding pass and passport. Then, she handed me the boarding pass for my flight to Manila. She told me that my luggage will already be transferred to my next flight. My flight back to Manila from Singapore was 1:55 AM the next day. Boarding began 30 minutes before the flight. My seat was in the front row this time. Tired and sleepy, I dozed off easily after getting to my seat. I didn’t realize anymore if what time the flight departed. One of the flight attendants just woke me up to serve my pre-booked meal. I had Nasi Lemak with Chicken and Fish Tofu, which I consumed quickly so I can go back to sleep again. It was already around 4:30 AM when I woke up. Few minutes after, the captain announced our arrival to Manila. 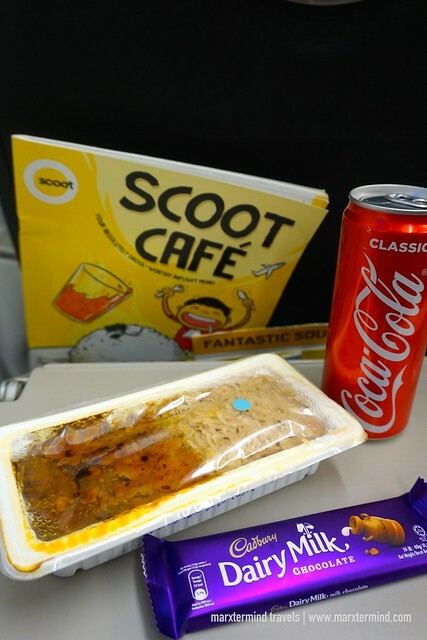 Flying with Scoot was considerably better than other budget airlines in Asia. I love how they go beyond the usual service for low-cost airline. On-board meals were delectable. Seats were comfortable with ample leg space. Aircraft looks fresh and modern. But the real standout for this experience was the Scoot’s 787 Dreamliner. I didn’t realize I was flying on a budget airline. 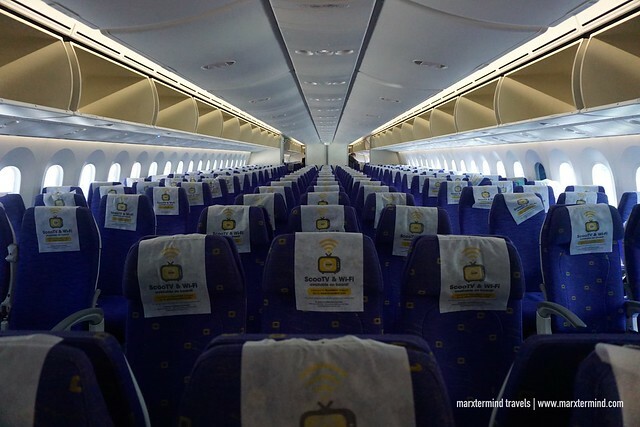 Experiencing Scoot in Silence Zone made me love long haul flights on budget airline. 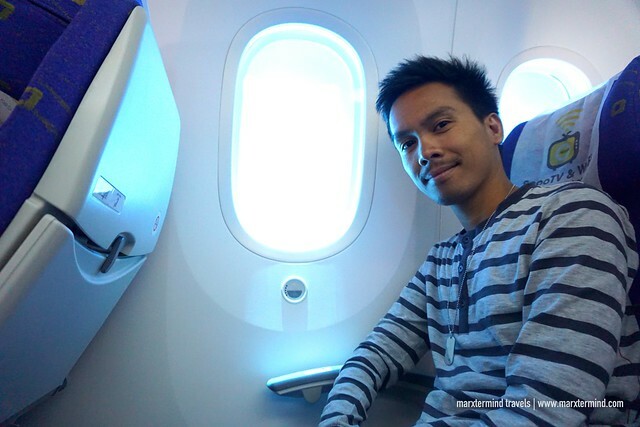 Now, I couldn’t wait to scoot again and escape to the other 53 destinations from Manila. Scoot is a Singaporean low-cost long-haul airline owned by Singapore Airlines through its subsidiary Budget Aviation Holdings. It launched its first flights in June 2012 on medium and long-haul routes from Singapore. Scoot now operates 24 Airbus 320s and 14 Boeing 787 Dreamliners flying to 61 destinations. Book flights to your favorite Scoot destinations now via www.flyscoot.com! HI! I just want to ask if you paid a fee at the airport in Gold Coast on your way back to Manila? Your article’s a big help. Thank you! Hi, Audrey. I didn’t pay anything from the airport in Gold Coast.